We made the Pursuit to provide intuitive adjustments so you don't have to manually adjust your chair as much throughout the day. You'll get a fabric seat with a mesh back on the Pursuit, which is the ideal combo of support and breathability if you work in a warm office. The Pursuit also comes in two color options, so it matches more styles of decor. Still have questions? Check out our chair comparison chart for a quick look at all of the features! Can I order this without the headrest? No, the Pursuit is only available with a headrest, which cannot be removed. The Ergohuman and UPLIFT Pursuit are very similar in the adjustments they offer. The UPLIFT Pursuit edges out the Ergohuman in the affordability category. The Pursuit is only available with a mesh back and fabric seat. Does the Pursuit come in any other colors? At this time, black and white color options are available for the Pursuit. Why is this cheaper than other chairs? We manufacture the Pursuit chair, so we are able to offer it at a better price. In addition, the adjustments have a manually-controlled notch design, which provide durable adjustments at a more economical price point. The arms can be raised or lowered by lifting up on the front of the armpad. The arms will lock into place once you reach the desired height and release the front of the armpad. You can also rotate the arm pads toward or away from your body. Yes, the back of the Pursuit can be raised or lowered. Just push forward on the back of the chair until you feel the back unlock. Then raise or lower the back to your desired height and release to lock the back in place. Our showroom is located in Austin, TX. Come on down to try out the UPLIFT Pursuit Chair in person. Is the seat depth adjustable? No, you cannot adjust the depth of the seat. What do you mean by "usable seat depth" in the specifications table? The backrest of the chair sits slightly forward making it so you cannot sit on the back portion of the seat that juts below the backrest. This still leaves you with a seat depth of 18 inches, which will fit most of the population. I need a chair with storage. Does the Pursuit meet my needs? The Pursuit is one of the only chairs on the market with organization built-in. The compartment located under the seat pan can be used to store small items. Does this chair come in additional sizes? At this time no, but we are working on expanding our chair line in the future. Can I order the Pursuit with different casters? In order to keep the price down, the UPLIFT Pursuit is only offered with standard, dual-wheel casters. Can the arms be moved out of the way? The arms can only be raised or lowered, they cannot be moved out of the way. The armrests are not removable. 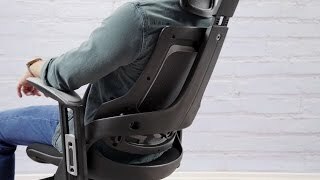 How adjustable is this chair? The Pursuit is highly adjustable! You can adjust the seat height, armrest height, armpad angle, headrest height, back height, lumbar depth, and recline tension. What is the chair height range? The seat can be adjusted between 17" - 21" high to support a wide variety of users. The Pursuit Ergonomic Chair by UPLIFT Desk is available in your choice of black or white. The black fabric seat and black body of the chair feature charcoal accents to turn this chair into a sleek focal point in your office. The white chair features a gray seat with white body and gray base for a clean look that suits most office spaces well.